In the French tradition of Provence the Holy Family comes to the village, and then only will the people gather around the manger. 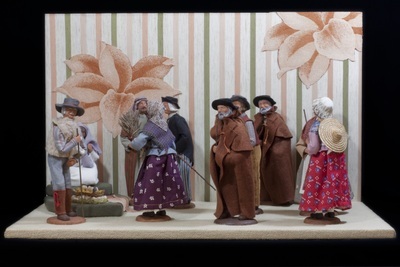 Provençal Santons — the so-called “little saints” — are most gregarious. And when Christmas comes, the whole village from the mayor to the village fool is mobilized. Without exception! Even the Gypsy woman with tambourine and brightly colored clothes is part of the cortege. Now have you ever seen a congregation of Frenchmen and women that does not engage in some lively discussion and dispute? And so this nativity scene could have been called “The Dispute.” From the running commentary by the farmer on the left looking at you — to the two ladies engrossed in conversation on the right side, the whole scene is bristling with a mixture of curiosity and enthusiasm. Not even Joseph escapes the quizzing of Professor Boniface. Meanwhile, Mary holds silent watch, and the “Bousquae-tiero,” the woman with the bundle of wood, delivers her modest gift. Twelve pieces made of terra cotta and cloth. Figures depict Jesus, Mary, Joseph, and villagers bearing gifts: grain, flowers, vegetables, ham, beverage, cheese, wool for spinning, etc. Exhibition label originally written by Fr. Johann G. Roten, S.M. for exhibit entitled "Elisabeth's Nativity House: The van Mullekom Collection" held at Roesch Library, University of Dayton.